Now, I’ve always been irked by those that complain after seeing a movie they did not enjoy – that they wished they had those 2 and a half hours back. There is just something about that statement that always kind of bothered me…until now. Because, well, I have to come clean and truthfully tell you I really wish for those 8 hours back spent listening to Eileen! Had the book been available to me, I might have switched to it, just so I could have sped up the time and reached the ending far sooner. But, I also have to say, it is because of the audio narration by Alyssa Bresnahan that I stayed with it until the end. (The long and bitter end.) Bresnahan embodied Eileen perfectly. When I first started listening, and heard Eileen describe herself as invisible to most, dowdy, a hater of people and of her body, but a lover of bowel movements (yes, I’ll unfortunately say more on this in a bit), Bresnahan’s voice rang so splendidly true to this character, I was rejoicing at having the opportunity to listen to it in audio. Therefore, thank you to Recorded Books for the audiobook, it is appreciated to have received it, I only wish it was a more pleasant experience for me. I think the issues I have with Eileen rest with the description provided for it, because it didn’t turn out to be what I was expecting, based on this description: “A lonely, young woman working in a boys’ prison outside Boston in the early 60s is pulled into a very strange crime, in a mordant, harrowing story of obsession and suspense.” It was this “a very strange crime” that I was waiting for. And the suspense. And the Hitchcockian twist that was also used in its description. I waited, and waited and waited some more. But, it turns out, this strange crime isn’t the crux of the story at all. Instead, Eileen is more of a character study. The description also claims to have a “Hitchcockian” twist. I didn’t find any twists, really. 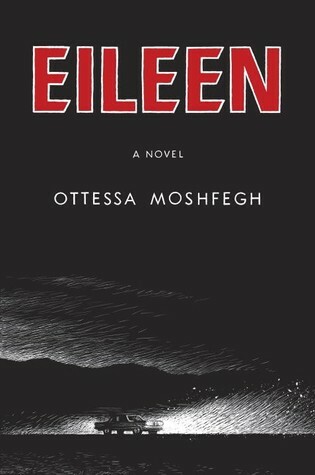 Overall, Eileen is simply an exploration in the daily life of an unhappy, dark and creepy woman. It is primarily devoid of plot and I became increasingly anxious about it, because I was waiting for a twist, and a crime, both which never really fulfilled the expectation. Instead, (and truly, Conny, on Goodreads, gives an excellent review, and is one that summarizes my own thoughts about it) Eileen is an 8 hour audio of her life, her excruciatingly unhappy, sad, and pathetic life. It is a dark and strange narration about her numerous odd habits, her hatred for her alcoholic and self-esteem crushing father, her excitement over bowel movements (her own and others), her prudishness and many other odd idiosyncrasies. It was devoid of any mystery, and any “Hitchcockian” twist, in my opinion, and it unfortunately droned on. It became rather boring to listen to and I grew increasingly anxious and frustrated for the reveal of this “strange crime”. While in its early stages, yes, Eileen is an intriguing story with this noir-vibe to it, but after the many and repeated mentions of bowel movements and hatred for her drunken father, other people, and her own self-hatred, I became frustrated and often shouted, “Get to the Point Eileen!” This very strange crime, isn’t as strange at all, and you have to wait until the final CD for its ( highly predictable by this point) reveal. The ending does have a few more remarkable moments to it, as Eileen stuns us further with her strangeness, but by this point I was so exhausted by her, I couldn’t wait for it to be over. I just brought this home from the library. Very curious now to see what I think of it! She’s a dark woman for sure Naomi! But if you go into it just knowing that it’s perhaps more of a “character study” you may approach it and receive it more positively than I did. There are a number of parts that are quite good where Eileen is describing her life, herself, etc. but then I found it continuing in this circle and wanted it to move forward. Let me know what you think Naomi! !